One way to make fruits and vegetables more convenient is to buy them pre-cut and packaged or to cut them up yourself soon after you bring them home. However, cutting, slicing, chopping or peeling fruits and vegetables reduces some of their nutritional value. Learn what you can do to get the most from your produce. The three factors that lead to nutrient loss are heat, oxygen, and light. The interiors of uncut produce are protected from oxygen and light but exposed when cut. The nutrient that suffers the heaviest hit in cut fruits and vegetables is probably vitamin C, although some vitamin A and vitamin E get lost as well. These vitamins are antioxidants, which means they react to oxygen. The peels and coverings naturally protect the antioxidant vitamins inside. Once you break through the protective coverings, the flesh inside is exposed to air and the oxygen reduces the antioxidant vitamins. Vitamin C is carried by water, which is why it is easier for it to leak out in the fluids released after cutting, or in water, you may use to rinse the cut produce. Vitamins that carried in fat, such as vitamin D, do not leach out as easily. Cutting also raises the respiration rate, which results in sugars inside the produce being broken down and carbon dioxide released. This can result in faster spoilage as well as a change in the taste and texture of the produce. Lower temperatures help slow respiration, so pre-cut produce should be kept refrigerated. 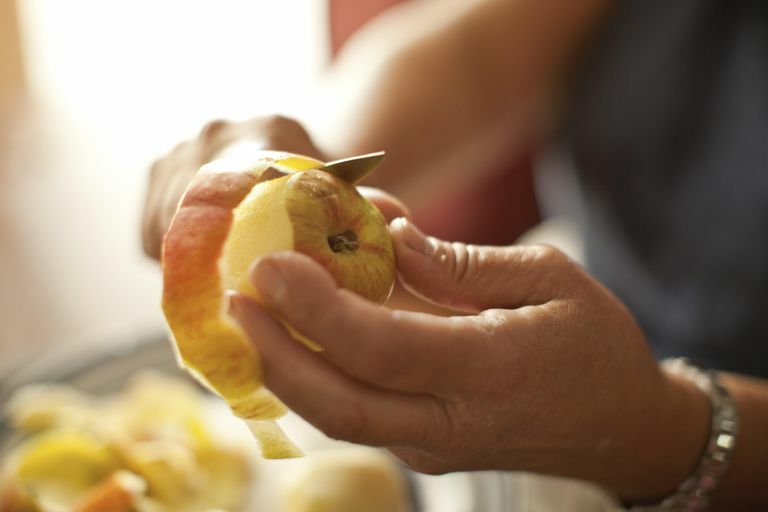 Most other nutrients, including minerals, B-complex vitamins, and fiber, aren't lost after cutting or peeling the inedible rind from fruits and vegetables. For fruits and vegetables with edible skins or rinds, it's best to eat them intact so you get the nutrients and fiber contained the rind. Potatoes, carrots, and cucumbers, for example, can be simply rinsed thoroughly and used as they are. Time is an important factor in nutrient loss. Look at the dates on the packaging and buy the freshest produce, especially if they are pre-cut. You should only buy pre-cut produce that has been kept refrigerated, as low temperatures also reduce nutrient loss. Ideally, you should eat any pre-cut fruit in two to three days and pre-cut vegetables within five to six days. Keep that in mind when stocking up at the market or the warehouse store. They are great for grab-and-go for a snack or making a meal soon, but not the best for long-term storage. The best way to store fruits and vegetables is to leave them unwashed with the skin or rinds intact until the day you plan to eat them. You don't have to wait until the last moment to cut your produce, but be sure you keep them stored in air-tight containers in your refrigerator once you have you cut them. It's also best if you can leave them in large chunks. Less surface area means less oxygen exposure and more vitamin retention. Use a sharp knife when you cut vegetables or fruit. A sharp knife, as opposed to a dull blade, doesn't bruise the produce as much. As a result, there is less leakage of calcium and potassium and less production of off-odors. Also, be sure you use a clean knife so you aren't introducing bacteria or mold, which will lead to spoilage. Produce starts looking bad even before it begins to lose nutrients significantly. Once your produce has started to shrivel, turn deep brown, or show signs of mold or decay, it's time to compost it rather than eating it. It can be tedious to have to wash and chop your fresh fruits and vegetables when you're busy with other things. You may find yourself with a crisper drawer full of "aspirational vegetables" you meant to use, but you couldn't face the work (however minor) that was needed. The small difference in nutrients is completely lost if you don't eat the produce because it wasn't convenient. Having fresh fruits and vegetables all ready to go might make it easier for you to make healthy choices at snack time. So go ahead and purchase fruits and veggies that have been washed and cut into pieces. Just keep them in their containers and remember they won't last all that long. Jeffers L. Do You Buy Pre-Cut, Bagged Vegetables—Are They Just as Nutritious? Cleveland Clinic. https://health.clevelandclinic.org/do-you-buy-pre-cut-bagged-vegetables-are-they-just-as-nutritious/. Raw Produce: Selecting and Serving it Safely. United States Food and Drug Administration. http://www.fda.gov/Food/ResourcesForYou/Consumers/ucm114299.htm. Tiwari U, Cummins E. Factors Influencing Levels of Phytochemicals in Selected Fruit and Vegetables During Pre- and Post-Harvest Food Processing Operations. Food Research International, Volume 50, Issue 2, March 2013, Pages 497-506.